The pack of 14 African Wild Dogs (also known as the Painted Dog, or African Wolf) that were released on Tembe Reserve two days ago, are slowly getting acclimatized to their wild new home. 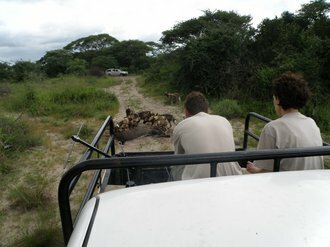 Wildlife Volunteers helped Wildlife ACT monitor Cilla Pickering, load an Nyala carcass onto the back of the monitoring vehicle, and strategically dropped it just outside the open gate of the holding pen (‘boma’) where most of the pack have been staying for the last year. The Wild Dogs took their time to make their exit from their large holding pen. Interestingly it was the one of the pups, who were all born in the holding pen just a few months ago, to make the first dash into unexplored territory, with the the rest of the pack following suit in drips and drabs. Having ignored “lunch” during their release, the Wildlife ACT team picked the Nyala carcass up again, and started following the pack as they gingerly started exploring their surroundings. When the pack stopped to rest after a few hours, conservation volunteers Sam and Suzanne dropped the carcass near the resting pack. In a flash, all 14 dogs started feasting on what will be their last “free” meal. Since then, the team has been monitoring the packs’ every move, as they slowly start exploring their new home, never moving more than 1 or 2 kilometres from their old holding pen. Understandably, the pack still seems to be a little unorganised. This morning for example, our team watched as the pack came across a small herd of Impala – their first opportunity to hunt! Instead of focusing on one impala to chase down, the pack got split and ended up chasing 3 impala. Needless to say they did not manage to catch anything… not the best first attempt, but it will only improve from here! Wild dogs are well known for their hunting proficiency, with over of 80% of hunts ending up in kills – the most for any African predator. Although it will be some time yet before this new Tembe pack reach that level of success, we hold thumbs that they manage to bring down their very important first meal, in the next few days. Hold thumbs with us! We’ll keep you posted.